The RWW is the most important insect pest of rice in Louisiana. Adults enter fields either before or after permanent flood. Injury begins when adults feed on plant leaves, making longitudinal scars. If scarring is excessive the field will sometimes have the appearance of being “painted” with white paint. In some instances adult feeding can be severe enough to merit an insecticide spray before application of permanent flood. Mating commences soon after adults enter the field, but oviposition of eggs occurs after application of permanent flood. Larvae hatch from eggs, feed briefly within the leaf sheath, and then swim through the flood water to burrow into the mud and begin feeding on the roots of the rice plant. This larval feeding on the roots is the primary source of damage caused by rice water weevils when they attack the rice plant. In some cases, root pruning can be so severe that plants will fall over in the field. In other cases, root pruning in not severe enough to cause lodging but can still significantly reduce yield. Location: South of Crowley, LA – at the intersection of Leger and Nelson Roads. 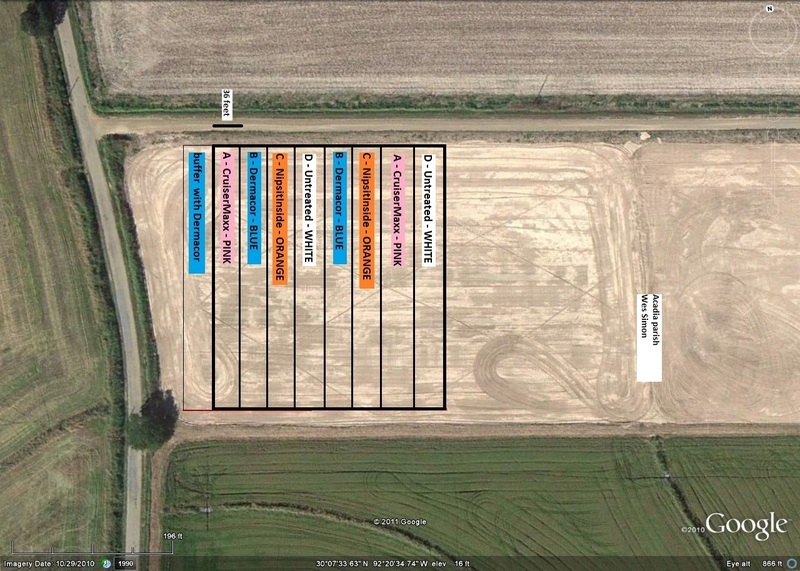 You can find a map of the field site by clicking here. 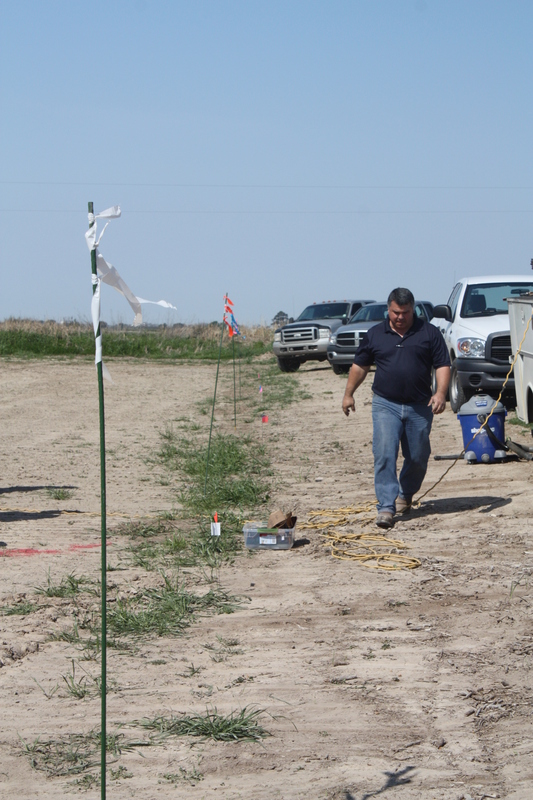 The purpose of this demonstration test is to compare currently recommended insecticides on commercial farms in Louisiana. This year are comparing three insecticide seed treatments (CruiserMaxx, Dermacor X-100 and NipsIt INSIDE) to an untreated check. Method of data collection: Counting the number of plants and taking plant heights on ten randomly selected plants at five random locations in each strip. We did not notice any obvious visual differences between seed treatments. Method of data collection: Core samples gathered by walking through the field pulling cores at equally spaced intervals across the field. 10 samples were taken in each cut (20 cores/treatment). RWW core data is an average of 20 cores/treatment. 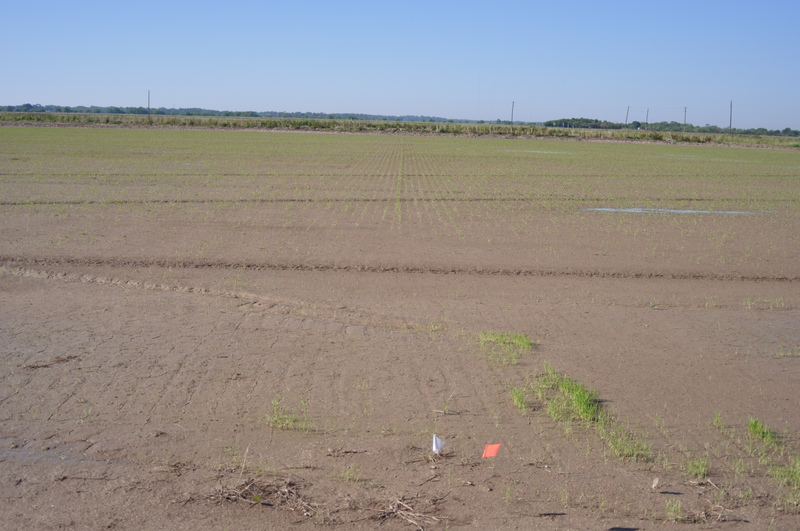 The infestation at this field site did not turn out to be severe enough to justify the cost of a seed treatment, but at some of our other test sites the infestations have been severe. We have collected up to 40 larvae in a single core. 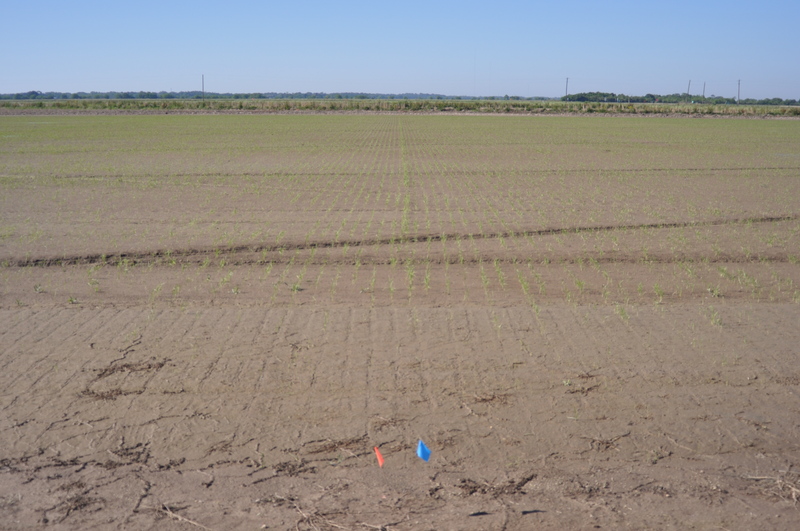 Once we are finished with all the core samples and can compare to the small plot trials Mike Stout is conducting at the LSU AgCenter rice research station, we will let you know how all the seed treatments have performed this season. 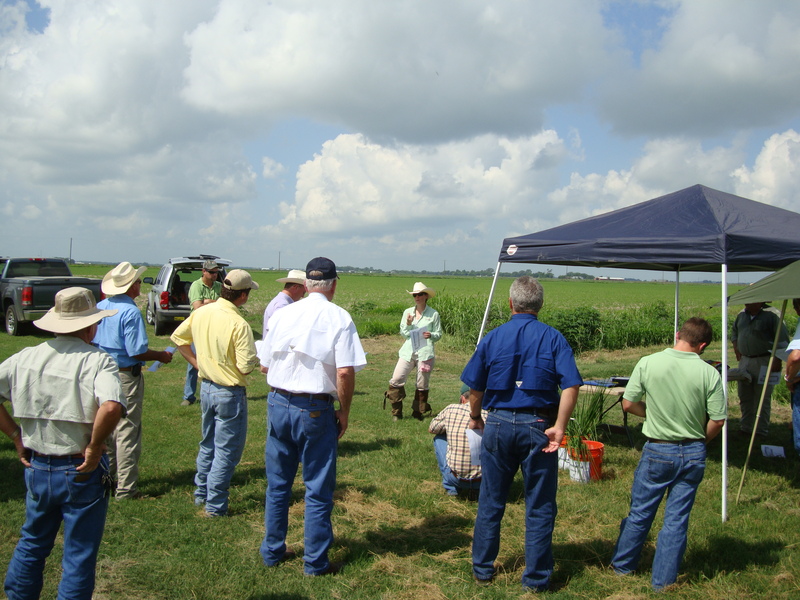 If you have any questions about RWW management or this demonstration please contact your local County Agent Barrett Courville or LSU AgCenter Extension Entomologist Natalie Hummel at nhummel@agcenter.lsu.edu. A lunch was served that was sponsored by Dupont (Toby McCown), Syngenta (Josh Zaunbrecher), and Valent (John Bordlee). Rustin Gilder also provided a tent and tables for the lunch area. You can’t put a price on the value of shade in the middle of the summer (oh, wait, we are only two days in… guess it will be a long one). We appreciate their on-going support of the LSU AgCenter rice extension entomology program. Rice stink bugs are starting to show up in some of the fields that are heading. I’ll post a blog about this pest tomorrow. Today Anna and I met with County Agent Barrett Courville and Crop consultant Rustin Gilder at the Acadia Parish demo site which is farmed by Glen and Wes Simon. We were pleased to find a healthy, rigorous stand of rice. 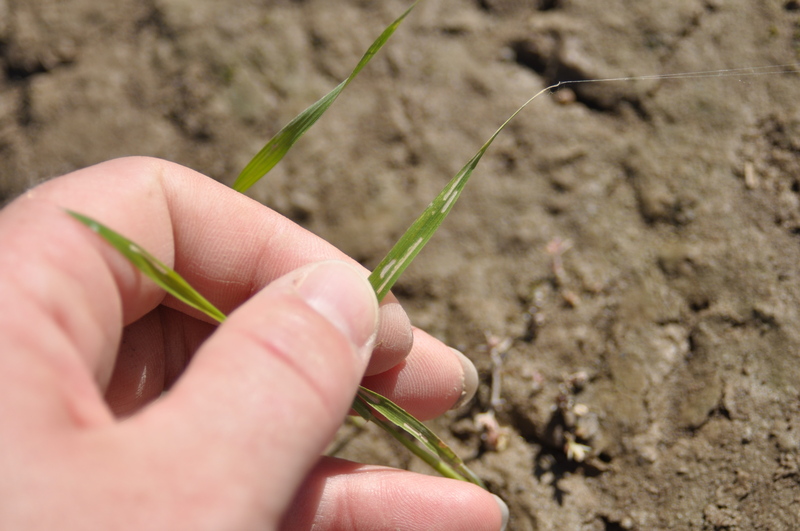 Much of the field is already at tillering stage just two weeks after seedling emergence! This location was planted with XL745 at #25 seeding rate. We used the same method as last year – counting the number of plants and taking plant heights on ten randomly selected plants at five random locations in each strip. Anna Meszaros and Barrett Courville taking stand data in Acadia Parish. Rice grown from CruiserMaxx treated seed to the right and Dermacor X-100 treated seed to the left. 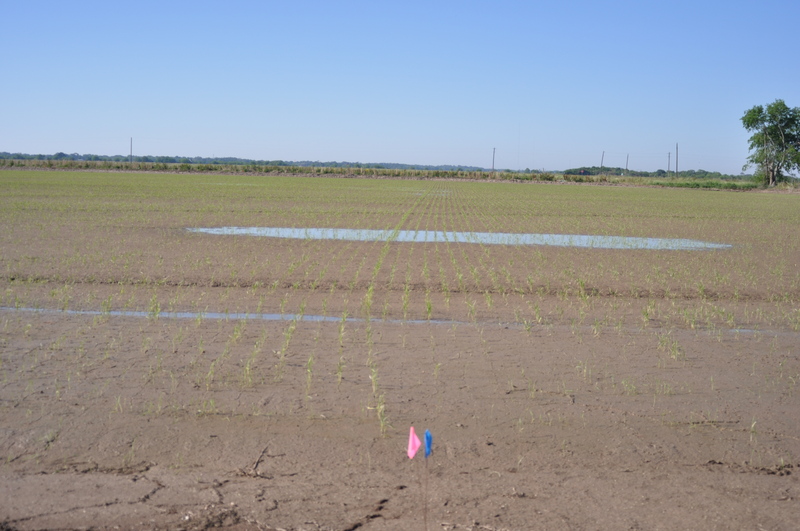 Rice plants grown from CruiserMaxx treated seed to the right and Untreated seed to the left. Rice grown from Dermacor X-100 treated seed to the right and NipsitInside treated seed to the left. Rice grown from NipsitInside treated seed to the right and CruiserMaxx treated seed to the left. Rice grown from seed treated with NipsitInside to the right and untreated seed to the left. 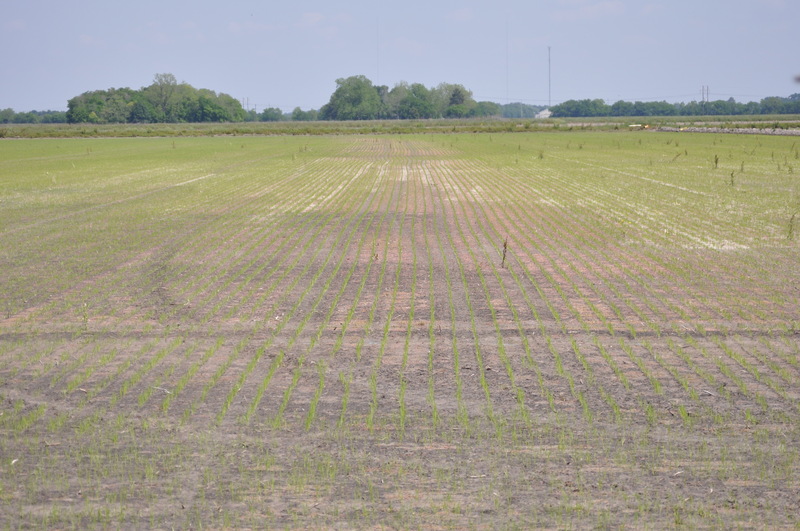 Rice grown from Untreated seed to the right and Dermacor X-100 treated seed to the left. It was not difficult to find rice water weevil adult scarring in the field. We did not observe any rice water weevils. The field had recently received a flush. It was difficult to assess a difference in the severity of scarring between treatments, but our sense was that it was a little more prevalent in the untreated strips. Rice water weevil adult scarring injury on an untreated plant. We will continue to monitor this field for any other insect problems that might occur. The next step will be to take rice water weevil core samples four weeks after permanent flood. It sure is dry out there – we could use some good rain. 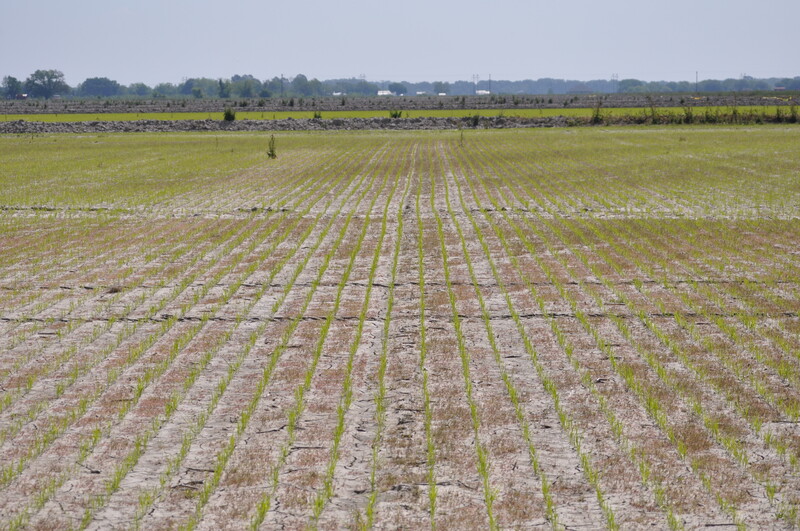 In these dry conditions it is important to remember to actively scout for chinch bugs – they tend to thrive in these dry conditions, especially if weeds or pasture near a rice field start to dehydrate. Planting at Acadia Parish rww demo test site. 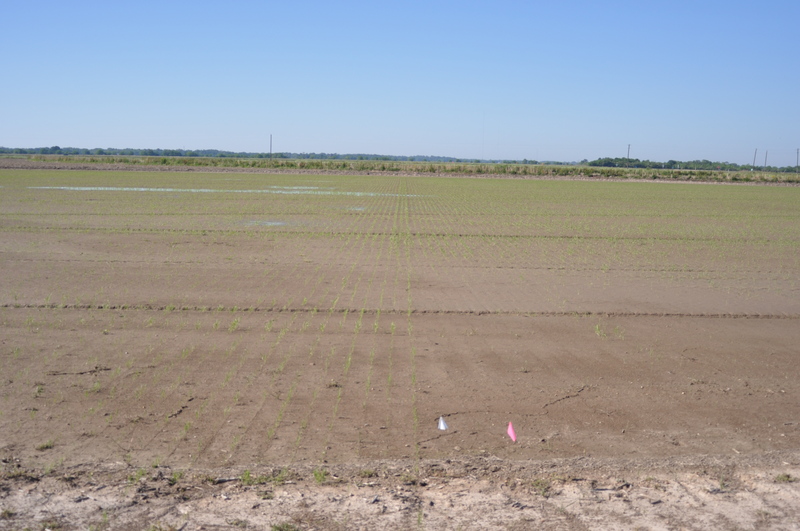 On March 16, 2011, we planted our first site for the 2011 LSU AgCenter rice water weevil demonstration test. 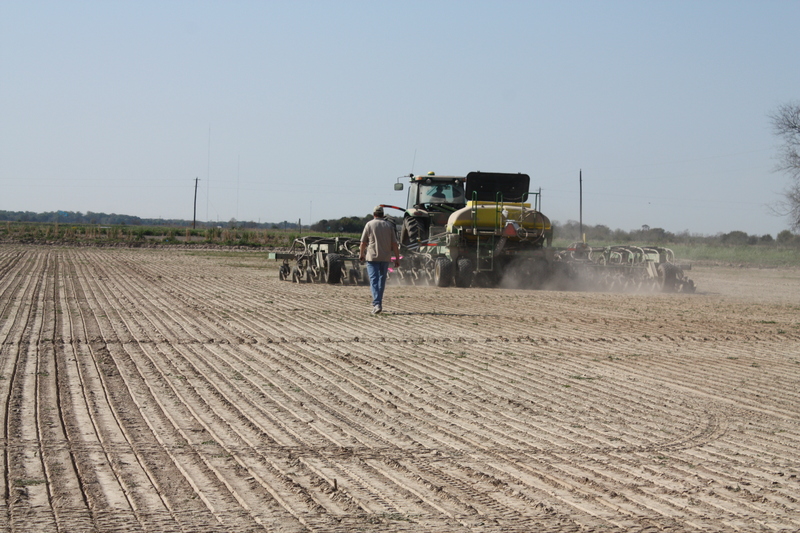 Acadia Parish County Agent Barrett Courville following the drill as we planted the test plots. 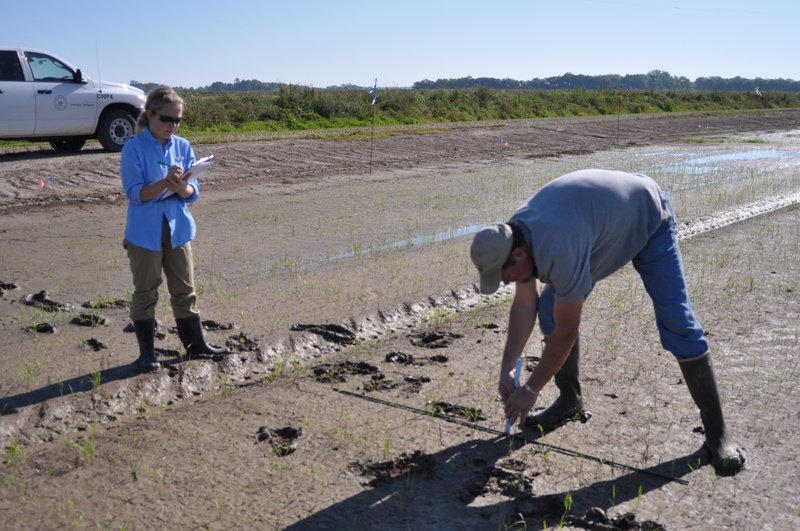 The purpose of our rice water weevil demonstration test is to compare currently recommended seed treatment insecticides on commercial farms in Louisiana. This year we are comparing three insecticide seed treatments (CruiserMaxx, Dermacor X-100 and NipsitINSIDE) to an untreated check. Rustin Gilder walking near the flagging on the edge of the plots. Flagging is color-coordinated with the treatments to make it easier to monitor progress during the season. We will take stand counts and plant height data 2 weeks after seedling emergence. To assess insecticide efficacy, we will collect rww soil cores 4 weeks after application of permanent flood. Field map with color-coding for the treatments. Feel free to drive by and watch the field as the crop matures during the season. 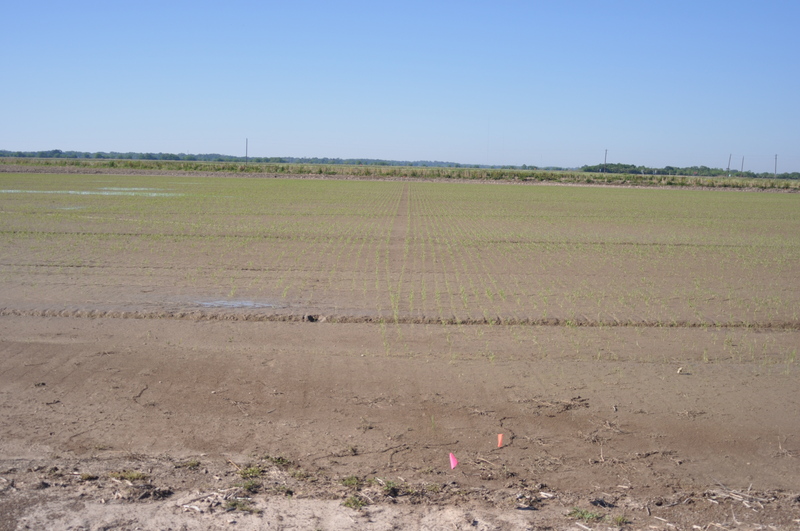 We intend to have a tour stop at the demo test site at the conclusion of the LSU AgCenter South Farm Tour this summer. Please monitor the blog for an announcement about the date and details. 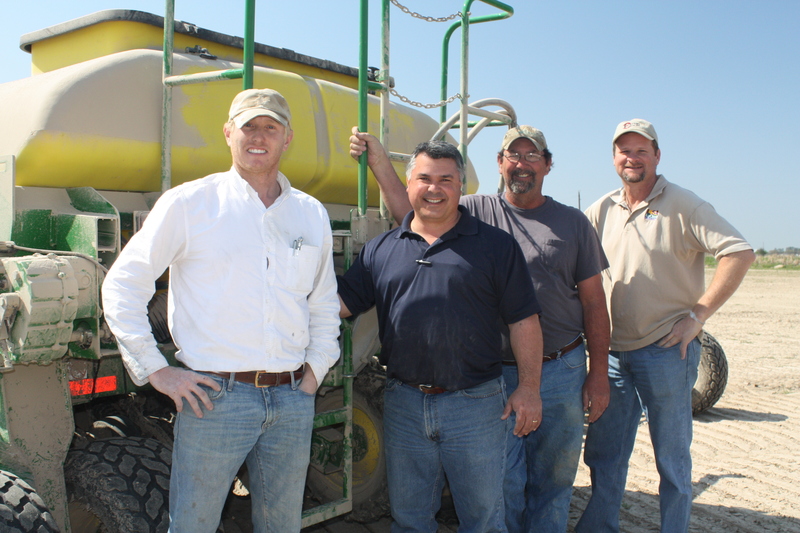 Acadia Parish Demo test cooperators Wes Simon, Rustin Gilder, Terry Istre and Barrett Courville. We greatly appreciate the tremendous effort in time and land-use by our cooperators. We will keep you posted on the progress at this site. For additional information, please contact Barrett Courville. We have finally concluded all of the core sampling for our demonstration test this production season. We have gathered all the data and Anna conducted a statistical analysis. In this analysis each location is treated as a replicate. 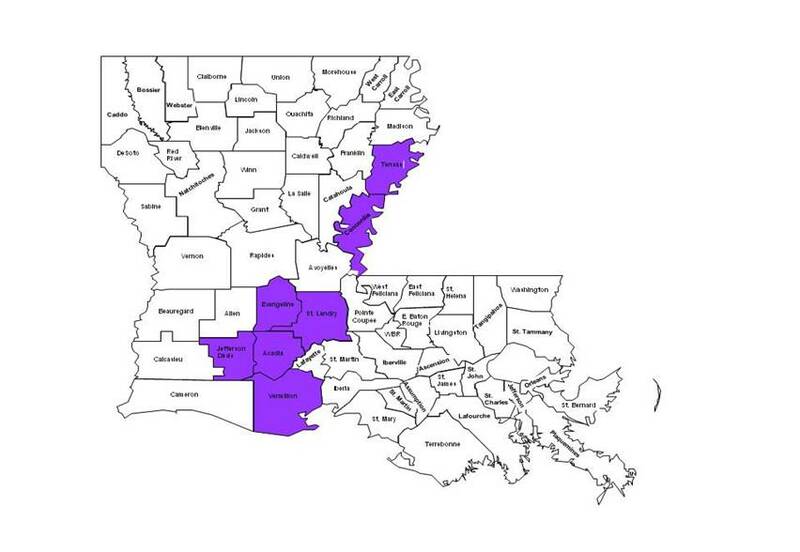 Our demonstration test was conducted in all the Louisiana parishes highlighted in purple. We had a total of 15 sites included in our test this year. We started this season with 5 locations designed to evaluate rww management tactics. An additional 5 sites were set up to evaluate colaspis management. We did not have any colaspis infestations in the test sites. We gained three more weevil test sites that had been planted out either by seed companies or a cooperator, who requested we take samples. We wound up with a total of 10 locations that were included in the overall data analysis. More than 500 core samples were processed to generate this dataset – that’s a lot of backbreaking work to pull all the cores and then to wash all that mud from the roots! Thanks to our cheerful, hardworking crew for completing this task without complaint. We collected weevil cores from all sites 4 weeks post flood. Our standard method is to take 10 cores per treatment, in a zig-zag pattern across the field, making sure to pull cores from the edge and middle of the cut. A few trends broke out in the dataset. In Acadia and Jeff Davis Parishes, we had a relatively light infestation with weevils, except at one location (Lawson Farm) where we had about 10 larvae per core in the untreated check. In Vermilion Parish we had low to moderate infestations. In Concordia Parish we had an average of 10 larvae per core in the untreated check. In Evangeline Parish we had a relatively severe infestation with untreated counts averaging from 10.8 rww larvae per core at the LaHaye farm to 15 larvae per core at the Morein farm site. Our highest population was in St. Landry Parish where we had an average of 21.9 larvae per core in the untreated check. While, in Tensas Parish (our most northern location) we had an extremely light infestation with zero larvae per core in the untreated check and the highest count of 0.15 larvae per core in the Dermacor X-100 treated cut. Interestingly at this location, we had a fairly severe infestation in the 2008 production season. 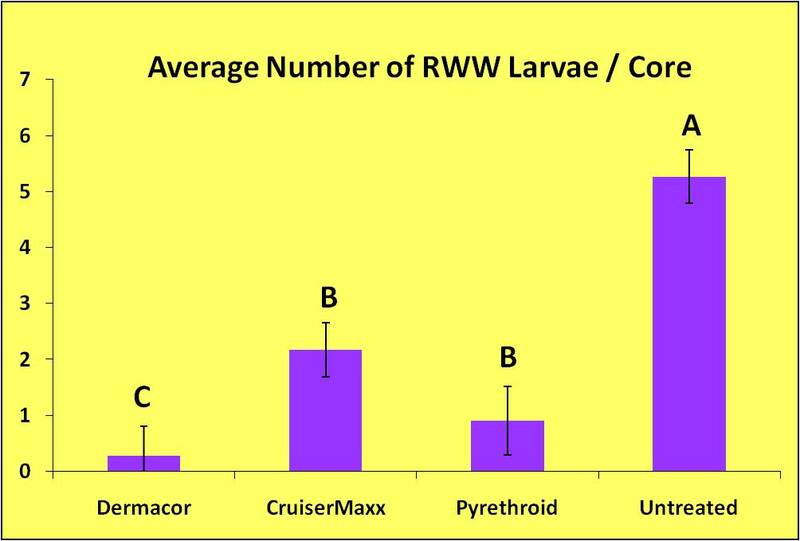 The graph that follows summarizes the average number of rww larvae per core when we analyzed the entire dataset. Average number of rice water weevil larvae per core (calculated from 10 cores per field or cut). Different letters indicate a significant difference in the treatment effectiveness. Overall, Dermacor X-100 provided the best level of weevil control, followed by pyrethroid (either Karate pre,Karate pre + mustangMax on fertilizer post, or Karate post) and CruiserMaxx. Dermacor X-100 provided significantly better control than the other two treatments. There was no signficant difference in the core sample average between the pyrethroid and the CruiserMaxx seed treatment. Unfortunately, the results from the Hybrid test plots (25 pound or less seeding rate) did not provide any more clarity about the ability of CruiserMaxx to provide effective weevil control at the low seeding rates. We plan to repeat the demonstration test again next season, particularly focusing on the low seeding rate question. Mike Stout has some small plot replicated research that may also clarify the question of effectiveness of CruiserMaxx at low seeding rates as currently labeled. This was certainly an interesting weevil season, and we learned a lot about weevil management, and just how difficult it can be to scout for adults and properly time insecticide applications. We greatly appreciate the support and cooperation of all who are involved with the demonstration test. Please contact your local county agent, or me, if you have any questions about our observations this season. Today Anna and I visited a few field sites in Acadia Parish. This was a long day in the field and I haven’t had time to download pictures yet, I’ll try to add some in the morning. It is really starting to heat up out there, both temperature wise, and with the pace of the crop growth. 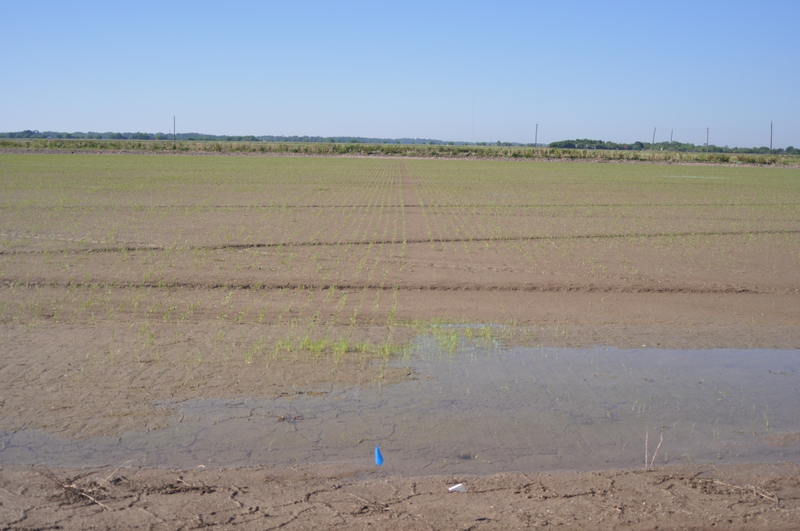 Many of the rice water weevil and colaspis demos are already flooded or very close to going under permanent flood. We stopped and scouted for adult rww and scarring at the Hoffpauir demo near Rayne, La. A pyrethroid treatment had gone out in two of the cuts this morning. We did find scarring at every location where we looked. We also checked the untreated cut and a cut that had Dermacor X-100 seed treatment and found rww scarring in both those cuts. We found one adult rww in the pyrethroid treated field, maybe the sucker hadn’t died yet, or it was slowly dying – one can only hope… So, it looked like a treatment was called for at the Hoffpauir demo. Now we will go in about a week after permanent flood and re-scout for weevils to make a decision about a second pytrethroid application. Next we visited the Lawson farm on Hwy 13 just north of Crowley. This is a location that is a joint effort between Horizon Ag and LSU AgCenter. We scouted the variety test, which has a mix of seed treatments and untreated blocks. Steven Thevis joined us to take stand counts and plant height measurements. We also looked for rww adults and scarring. Scarring was not very common at this site. This location was selected because of a possible risk of colaspis injury. So far, we have not seen any colaspis at this location. We will continue to monitor the field. The flood will probably be put on by the end of the week. The most interesting visual at this site was the difference in stand thickness between the untreated and the CruiserMaxx treated blocks. You could really see this with your eye. I’ll post a picture tomorrow. Finally, we headed over to a field just east of the rice station where a colaspis larvae had been collected. There was some difficulty with stand emergence to begin with at this field, and there are still some plants that are dying. One colaspis larvae was collected by Doug Leonards. Anna and I dug around the plant roots in trouble spots for a while, but did not find any colaspis. We’ll keep an eye on the field. I’ve had one report of colaspis injury in Ville Platte, La. A flush was put on the field in an effort to slow down the damage and save the plots. We are waiting for the ground to firm up toward the end of the week, then I’ll head out there to scout the field. I also checked in with Barrett Courville today. He reported some chinch bug injury in drilled rice. This is a good reminder to be looking for this pest. CruiserMaxx should provide control, but Dermacor X-100 will not. 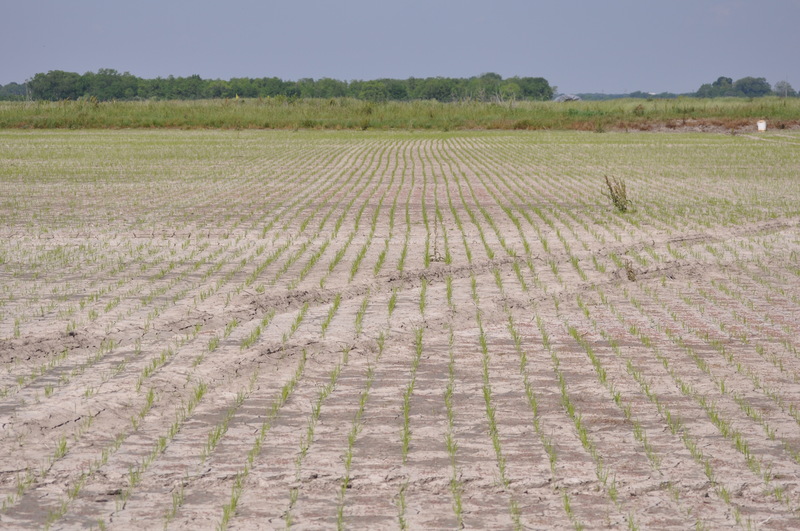 So, be sure to continue scouting drill-seeded rice even before application of permanent flood for early-season pests. Yesterday Barrett Courville and I took stand counts at the Hoffpauir Demo location that is just southwest of Rayne, La (Acadia Parish). Boy, it was another beautiful day here in south Louisiana! The fields are coming along well. We took stand counts and plant height measurements in Dermacor X-100, Cruiser-Maxx and one untreated cut. We will be entering and analyzing the data soon. In the meantime, here are some pictures of the fields. Plants grown from Dermacor X-100 treated seed. Plants grown from CruiserMaxx treated seed. Plants grown from seed that had fungicide, but no insecticide seed treatments. The flush was starting to move across this field. The next step with this field will be to scout for rww adults in the days leading up to permanent flood. If rww adults and scarring are found in the field, we will apply a pyrethroid to two of the cuts at the eastern end of the series of cuts.